Elements Applied: The commonly applied plant parts are flowers, root bark and leaves. Various gums, resins, phenols, and tannins. History: The plant was discovered by the first American colonists, when they cam to the east of the country. Still, they had no idea about its medical characteristics and used it as a raw material for aromatic candles. In America bayberry was applied for medical only in southern regions, where local residents used it to reduce fever. After a certain period it was practised in Louisiana as a remedy for severe dysentery. In the XIX century the herb gained awareness among people thanks to a homeopathist from New England, whose name was Samuel Thompson. He prescribed it as a potent remedy for fevers, diarrhea, influenza, colds, and various infections. In modern medicine bayberry is practised both in oral and external application. The former is used in case of sore throat, gum bleeding, flu, colds, dysentery and diarrhea; the latter is practised in case of varicose veins. Used For: Being potent of boosting blood circulation, bayberry is applied as an aid in many diseases, when dealing with them globally. Thanks to its astringent characteristics, the herb is now used as a treatment for dysentery and diarrhea. If applied for gargling the remedy soothes sore throat, while in form of douche it’s used to treat skin conditions. For the reason it contains myricitrin, an agent known for its antibacterial properties, bayberry is applied treating bowel conditions, including diarrhea. Myricitrin is also known to act as a cooling remedy in case of fevers, due to which reason bayberry was applied by American Indians. Additionally the herb contains tannins, also producing astringent effect, necessary under condition of diarrhea. Though there is no evidence concerning the possibility of gallbladder and liver condition treatment, myricitrin has also been linked with enhancing the bile circulation. Additional Info: Originally bayberry is found in the US, but nowadays it’s specially raised in Britain and Europe. The evergreen plant grows over 35 feet high in the southern and eastern parts of America. Close to the northern parts of the country its height gradually diminishes, and in the area of the Great Lakes it hardly reaches 3 feet. 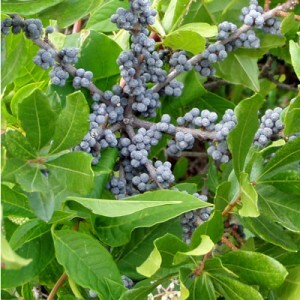 Bayberry is characterized by gray-colored bark, narrow and sharp leaves, and branches coated with wax. When cut the tree produces a characteristic smell. The tree blossoms in spring, its yellow-colored flowers gradually turn to small waxy fruits. Preparation and intake: When used in form of decoction, the plant extract is taken in a quantity of 1 teaspoon and boiled in 2 cups of water for 15 minutes. Consumed cold and aided with some milk. The daily dose is 2 cups. Decoction commonly tastes harder than a tincture, if its bitterness is unbearable, try a tincture. In form of a tincture, the dose is half a teaspoon two times a day. Children under 2 years of age are not recommended to take bayberry. For kids after 2, and those who are more than 65 years of age, a mild mixture should be used for the first time, with its concentration increased gradually. Commonly mixed with: To increase the astringent characteristics the plant is commonly applied in combination with Agrimony and Comfrey Root. Safety: People who have overcome cancer, notably stomach or bowel cancer, or have an increased risk of exposure to it should use bayberry with extreme care. Scientific studies have shown that tannins, in which the plant is rich, are potent of producing both positive and negative effect on cancer. The study was conducted on animals, and some of them developed cancer tumors, with others, on the contrary, showing signs of tumor decrease. To decrease the possibility of exposure to cancer, mix the herb with milk. In case of overdose bayberry may lead to indigestion, vomiting and sickness. Exercise care when using the herb if you suffer from digestive system disorders, like colitis. The pattern your body uses when processing potassium and sodium changes as you take bayberry. For this reason, if it’s kept under control, like in case of hypertension, heart or kidney disorders, you should speak to your health-care provider prior to applying the herb. Additionally, you should not use bayberry if you are breastfeeding or pregnant. In other cases bayberry is absolutely safe to be applied. The dosage you’re going to apply should be discussed with your health-care provider. If you experience any inconvenience after using the herb, quit taking it and visit your health-care provider for a consultation.